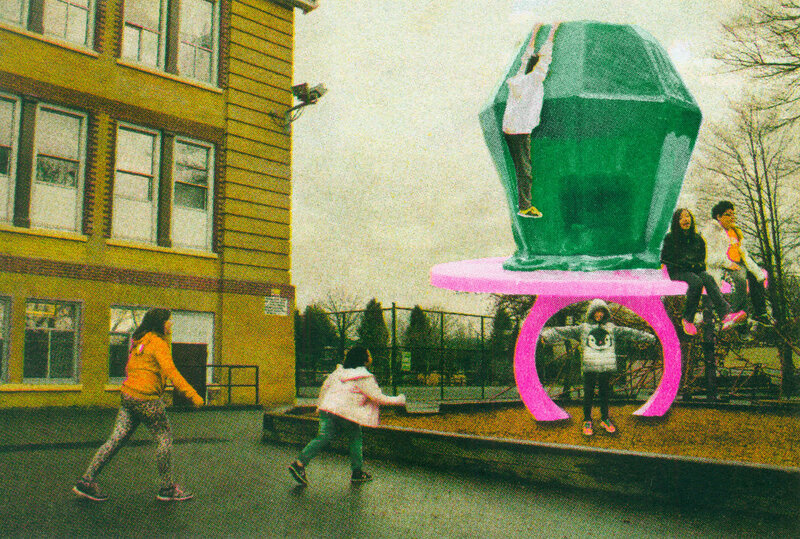 Under the alluring title Big Rock Candy Mountain, artists Hannah Jickling and Helen Reed run a candy factory with fourth-graders at an inner city school in Vancouver, Canada. Through the fantasy of this factory and junk food as a point of connection, the artists and the students have been exploring their desires and dreams, while producing their very own special edition chocolate bar studded with sour cherries and Nerds. On April 24, 2017, Hannah, Helen, and I met for brunch at Vanessa Kwan’s home in Vancouver. Vanessa is the curator of BRCM through the public art organization Other Sights. In preparation for the meeting, I asked them to build a menu for our gathering, thinking about brunch as socially sanctioned adult indulgence. Vanessa Kwan and Hannah Jickling preparing brunch, April 24, 2017. Photo by Liz Park. Hannah: When you suggested brunch, thinking about indulgence and feeling good throughout the day, I thought about pickled herring as laying the foundation for a good day. Helen: When we did taste tests with kids at Queen Alexandra Elementary School, whenever something had both sweet and sour, it was universally popular. This herring is sweet and sour. But they may not be into the texture. This is a value food, not valueless sugar bomb. Liz: But feeling good can be about instant gratification over long-term health. Hannah: We never had a conversation about BRCM and health in terms of sugar. It’s never been a focus. Helen: BRCM is about the culture of candy and desire. Vanessa: That’s the fear we had going into a school, where we might get turned away immediately because they don’t want to encourage the culture of candy to a young population. Hannah: I’m interested in how to cultivate [what Vanessa has called] “eccentric passions,” and rethinking what a treat is. Helen: Early on in the process, we went to see a documentary film on sugar. And it was horrible. That galvanized us into thinking that juvenile diabetes is not the issue of the project. Because we’ve always been approaching it as the culture of candy with its immediate buy in from kids, we’ve always tried to be not so moralistic about choices. Vanessa: The narrative in that documentary was very typical of how people try to be critical of candy. It became about fat-shaming. If you choose to be good, you can avoid the pitfall of candy. I’m not interested in getting into this kind of argument. How do we get past it to engage passionately with a medium to get to a new terrain? Liz: Hannah and Helen, do you see your collaboration as anticipating further collaboration with others? You’re running a candy factory after all, a project that requires multiple operators. Hannah: Helen and I used to hang out together at work parties before we were dating. We met in 2002. We first started courting through work parties, list-making and doing projects. Part of the romance for us was through collaboration, making plans and adventures together. Helen: Our collaboration as a couple is very different than working collaboratively with various groups of people. There’s intimacy in how our lives are intertwined. We have conversations about work during our domestic hours. Our collaboration is a third thing: there’s Hannah; there’s Helen; and there’s Hannah and Helen. Hannah: It’s 80% collaboration, 20% individual. Vanessa: It’s interesting to talk about work/love relationship. In terms of my own collaborative practice, I’ve been thinking more about how a queer practice would look like as a curator, producer, artist. In queer communities, people negotiate love and relationships. Not to say that it’s only and distinctly queer, but I noticed that among my peers a lot of effort goes into negotiating situations that will be sustaining—relationships that are often poly or open, unconventional relationships that we might not expect. The queer community has never been part of the heterosexual majority. So there’s something about negotiating a relationship into being what you want, and that’s very related to how collaboration works for me. In terms of my relationship to this project, it’s been a work in progress. The whole time, we’ve been very open. Hannah and Helen were very generous, asking me what I want from this project. My role often changes and has evolved for me, but we have talked about it not being a traditional curatorial role, whatever that means. At times I’m very involved in the conversations. Other times I’m not very involved. Sometimes I’m in negotiation with Other Sights, an organization I work with, and the elementary school. Other times I just hang out in the classroom, or I write a piece of text. We talk about ideas a lot. Liz: Did you start together from the beginning of the process? Helen: The three of us talked about it on the porch one day. Hannah and I were working on a book project based on another collaboration with kids. The book was stressing me out because it was so theoretical and distant from active engagement with young people. There was something that felt off to me. At that moment, we wanted to be in a classroom setting with younger people and we were discussing that loosely with Vanessa. That was 3 years ago. Vanessa was also excited to think about those ideas too. That was the inception of BRCM. How can we mobilize these ideas in a public school system? 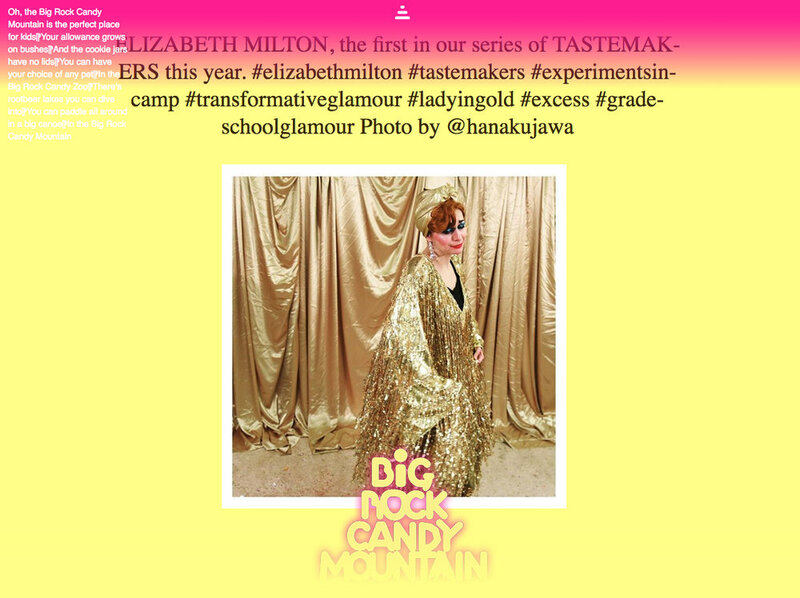 Liz: How did you arrive at the specific reference to the song Big Rock Candy Mountain? Helen: It was also the title of the alternative education supplement for kids for the Whole Earth Catalogue. It was a home-schooling resource. BRCM is a fraught song evident in the amount of revisions that had gone into it. Recently, someone told us about one version being about a hobo recruiting young boys into itinerant lifestyle and as young lovers. There was a queer bend to it. Very different from the Katy Perry or the Elmo version! In general, the best-known version still has a recruitment idea to it. I was aware of the song but had no personal attachments to it. The carnivalesque element is very present in it. Everything is upside down. It’s an interesting frame to start with. Hannah: You imagine the world beyond limits of what you experience everyday. In the song, a hobo dreams of alcohol trickling down the stream, cigarette trees, cops who have wooden legs, dogs that have rubber teeth, no doors in jail. When we first started our research we read a book about the song and the folklore in America, the idea of excess and debauchery. BRCM is a mythical place where there’s abundance, and you can drink all that you want. What is this mythical place for kids? How do you imagine that when you’re stuck in school? If you are to imagine beyond the limits of your current situation, what would you and could you imagine? Liz: Was the Whole Earth Catalogue supplement exciting to you because it made the project resonate with an existing alternative pedagogy? Helen: Possibly, at the beginning. The idea of alternative pedagogy has fallen away. In fact, we try not to say pedagogy, education, or learning at all. It’s too easy for people to understand it as artists going in to teach the kids. That’s the paradigm of artists working with young people, and that feels very unsatisfying to me. Hannah: We want to be with kids because of what they offer to us. Going through the school is getting access to that. Vanessa: How we’re working with the kids is a co-exploration. We have to look at our assumptions like who is doing the learning. Liz: Hannah and Helen, how do the kids understand what you’re doing? Since 2015, you’ve been interacting with the students through taste tests, a series of visiting artist talks, as well as producing chocolate bars and postcards of fantasy candy land. Do you tell them that you are running a candy factory? Helen: They understand us as fun-times Fridays. I think they’ve made jokes about providing labor. Liz: As in they are the Oompa Loompas? Hannah: Within the school system there’s a very clear understanding of productivity. What kinds of answers teachers want you to get versus what they’re thinking. We spent a lot of time to try and figure out what the kids thought of this project. I don’t know if we were successful in getting the kinds of answers we need. Maybe we’re producing weird memory that has value down the road. Liz: How do the teachers perceive the project? Hannah: I don’t think it’s as much a co-inquiry with the teachers as we’d like it to be. I think a part of it has to do with that school and that population. There’s a lot going on for kids outside of what needs to be accomplished in the classroom, and the teachers are amazing and they’re at that school for a reason. But they need a lot more support. For instance, when Helen and I brought in five visiting artists, we were quite excited about what they brought in terms of their practices and notoriety from different communities. But the teachers were most excited about the visits by the students that we teach at Emily Carr University of Art and Design. It’s Friday afternoon, the kids are squirrelly, it’s been a long week. For the teachers, to have 13 university students sit down to interact with the kids seemed to be most valuable. Liz: You call your project a candy factory for a reason. Yet, you don’t produce much. Hannah: We were talking about the factory metaphor to answer the question of what we produce. We’ve released a couple of products like the postcards and the chocolate bar that circulate as multiples/ephemera/publications, but also we have the website and the Instagram feed as production line conveyor belt of goods/images that are moving out into the world. Helen: The two initial references for us when we were jamming on the factory are Allan Sekula’s School Is a Factory and Warhol’s Factory. Hannah: Also, Charlie and the Chocolate Factory for its fantasy aspect. Helen: We recognize that we’re not running an efficient factory! Hannah: But we want to steep in the metaphor more. We wanted to use industrial signifiers, like the zigzag tear seam in the candies that we made. We’re doing a workshop with the Kamloops Art Gallery this week making cotton candy, and I am so hell bent on getting this die-punch used in packaging for hanging on a peg board in grocery stores. So I think we’re making aesthetic decisions that play with those signifiers. The zigzag tear seam made SOUR VS SOUR chocolate bar credible to the kids. Liz: This seems to be an aesthetic decision. You are engaged in a cottage industry, but you are putting on a drag. You are not a factory but trying to embody it. Hannah: This is totally a chocolate bar drag. Vanessa: I’m also thinking about the essay written by Zoë Chan on the project website. She discusses how the candy circulates. The candy has to pass in different places. It has to pass as a product. It has to pass as a contemporary art object. It has to pass to kids too. Helen: Maybe they’re slightly failing in each. Liz: I don’t know whether I should eat your SOUR VS SOUR Chocolate Bar, or keep it unopened as an art object. Hannah: You could eat both and order some more online! Helen: Hypothetically, they’re an unlimited edition until the chocolatier stops wanting to deal with us. Liz: Is it still in production? Vanessa: Yup. Think of all the time, energy, funding! Helen: The chocolate wrapper’s got three funders acknowledged on it: The Canada Council for the Arts, British Columbia Arts Council, and City of Vancouver! Vanessa: As a producer of an unlimited edition, BRCM is not a very productive factory. It has the visual of quickness but is actually very slow. Liz: That’s part of the upside down element of your project. Unlike Warhol’s factory that brought about a change in the production of art and along with it, a certain kind of aesthetic, you are imitating an industrial aesthetic. You are busy bodies doing laborious and meticulous work. Vanessa: Beyond the chocolate bar, there’s also the long term product–what are these kids going to be in the future? I had this thought: what if these kids grow up to be candy experts? They might be designing packaging for other products. We should consider this industry of creative engagement. Helen: What is considered labor? What are children producing in school? They produce “nothing” but they have to go to school and keep their hours. It would be considered crass if in school, the kids were producing something that could be capitalized on, I guess, except for knowledge. There’s also their labor on social media and the amount of content that children are producing for no compensation. Liz: Have you made any money on the chocolate bar? Liz: But that’s not net profit, right? Helen: We make a net loss! We haven’t done the economics of it. We’re curious. The other night, we were talking about appraisals. How would you appraise the chocolate? Vanessa: How would you collect this work? How would you collect it in a museum context? There has to be ways to preserve works like this. I’ve been interested in different archival processes outside of art. Hannah: At the school, there’s a healthy eating initiative coming down from the provincial government, and we don’t have the full picture in terms of how it plays out. Our first year there, one of the teachers who has been doing a bake sale every year to raise money was not allowed to do it anymore. And that teacher was asking why BRCM was allowed. There was the perception that we were throwing jellybeans into the classrooms, and encouraging gratuitous sugar consumption. We’re starting with candy to get the kids to engage, but we’re actually steering them in different directions. The conversation and criticality need to be cultivated more with the staff there but it’s hard with limited time. Liz: You are embedded in a real life situation with so much bureaucratic red tape. Working with kids is one of the hardest things. Has the mandate of healthy eating impacted what you do in the classroom? Are you still selling the chocolate bar you made with the kids in the school? Helen: Yes, it has impacted us. Last time we talked to the teachers, we were talking about having a box of chocolate at the school’s front office, so if the kids or their family are interested, they can still buy one at the reduced rate. And the teachers said, let’s leave that idea aside for now. We may revisit that at another point. For now, we aren’t selling the chocolate in school, which bothers me, because I feel like it’s something the kids who worked on it are really proud of. It’s something we’re proud of. We did one sale of the chocolate bar during their winter celebration when we sold out our stock of 100 chocolate bars in 20 minutes. The kids were selling them to their aunts or cousins. Hannah: Their names are on the packaging! Vanessa: There are all sorts of ways in which public art is questioned when it comes to safety. How do we make it safe for the public? The question that’s most pertinent to me is how do you make space safe for art? Safe even for an artwork that may introduce tension? There seems to be a fear around whether what we do may incite inappropriate behavior in the school as a public space. I ask the same questions – what public? Whose public? What are the standards and the regulatory conditions of the public space? The teachers and the principal who police that are afraid of the weirdness. Helen: Vancouver-based curator Lorna Brown wrote the introduction to our publication and she wrote about the space of the public school as essentially lukewarm. The public space is a space of moderation. So to come in there with candies, which is the opposite of moderation, in terms of its marketing, the language, and the aesthetics, we’re proposing something super extreme, super way-too-much. In bad taste. Hannah: Sometimes we have to pass as straight/normal so we can be slightly legit. Vanessa: We have to have legitimacy in these spaces but we are trying to slip in moments of wildness. The terms that Helen and Hannah use are feral, wild, “contact-high,” which are all unruly. It’s an elemental conflict between the mandate of the school and the mandate of the project. Hannah: That’s come up now again because what we want to do next year is gum! Vanessa: That’s very threatening to them! It comes from the inside of your mouth and gets stuck on a desk. Hannah: It’s gross and inappropriate. Helen: It’s the ultimate in useless. You keep yourself busy with it, then you spit it out. It’s junk – far from the healthy eating initiative. Liz: Are you making gum? Helen: Yeah, we’re in our early days. Liz: What has been the greatest challenge or disappointment? Helen: There’ve been more challenges in terms of negotiating the project into the school than we thought. We knew from the start that it’s going to be contentious and that’s why we were interested – the point of tension. But the practicalities had been more than I anticipated. It’s also more insidious in little ways where you feel like you’ve proven yourself to be responsible and to be producing interesting engaging experiences for the children, then you have a meeting that makes you think you’re back to square one. So that has been personally very frustrating for me – the lack of trust – but I also understand that the school system is a beast of its own with all these restrictions and challenges. The instability of it too – the school was on a closures list last year. What happens to all these relationships that we built then? Liz: We’re winding down—the inevitable crash after the sugar high. You have been using the term “contact high” to describe the initial feeling of elation when you started working with the kids. Where does it come from? Helen: Our friend, artist, musician Sydney Hermant. We were riffing with her because she wrote her graduate school thesis on this idea of contact high. Observing her daughter Gloria interacting with something new, she was thinking about how to incorporate that into her studio practice. She coined the term. We should definitely credit her. Liz: Are you still in a contact high? Helen: We go through waves. Last year was exclusively chocolate making. This year has been mostly the visiting artist series that we call Tastemaker sessions. When the project started in 2015, the first thing we did was to imagine utopia. That’s where the Tall Tale postcards came from. We made a bunch of drawings and language riffs around utopia. The second thing we did was make the chocolate bar with a different group of kids in 2016. The third thing we did was an afterschool program with those two groups of kids and that was studio time – make prints, gum, comics. This year, we’ve done some follow up with the chocolate bar, winter celebration and class visits. But it’s been mostly Tastemakers, which we started because we wanted to bring in other folks who were working with similar themes. Helen: I feel like we have a bunch of lingering questions and materials that we need to address. Hannah: We need to get the conveyor belt running again. We are planning to make a how-stuff-gets-made video of the chocolate bar. We have unresolved things like distribution. Vanessa: On my part, the project has been all sorts of pleasure, but tough because in context of Other Sights, maintaining a project that goes in waves over a course of 3 or more years has been a challenge for an organization that doesn’t have a lot of infrastructure. I have to figure out how the project should be supported through Other Sights and how we provide public contact points for the project, because we’re so often concerned with the school as the public we forget that there’s the other public. These moments of clarity like artist talks, launches, edition distribution, but it’s challenging when the organization doesn’t have the capacity. Liz: BRCM seems like a project that’s in progress. Do you see an end goal to it? Helen: There are things we’re excited about producing, but calling it an end doesn’t feel totally productive. Something we noticed with this project is that the deeper you get, the more there is. It took us one and a half years to build the platform. Establishing credibility within the school, the structure of the website, getting a couple of products out. We all have different relationships to the timeframe. Vanessa: We’ve had small goals along the way, like make the chocolate bar. But afterwards, there’s still lots of things that need to be done and there’s re-orientation of the brain, budgets, applying for more grants, figuring out how to close off one phase that lead into another one. How to write about this. How to contextualize this to the outside world. Might it become something like a non-profit, or something that you take outside of the school? It’s a scalable enterprise. Helen: It feels like we’re in pretty deep.